If you want to keep your approach to pattern subtle, why not just pick a stand-out piece? 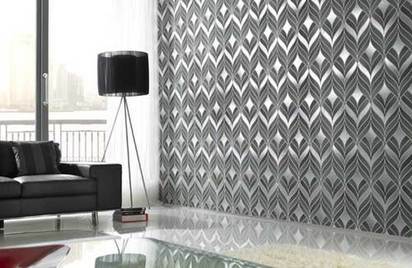 Deeply sophisticated, unusual silhouette designs will look absolutely beautiful in every room. But don't stop with the shape, look for something with pattern - or a piece that you can upholster to suit your scheme. In a small room, or a room where pattern isn't always appropriate in great quantities - such as a bathroom - you need no more than one or two highly patterned pieces, set against a dramatic background - to have a big impact. If you are going to try this, upholstery is a good place to begin - or failing that, a piece of highly decorated, painted furniture. Pick a piece that looks like it belongs and fits in the room or its eye-catching pattern will just help it feel more out of place than it otherwise would. Then, pick a colour that suits the room, but doesn't necessarily match with everything else. The more dramatic the print, the better, and, if you can work texture into the print, too, it will be all the more effective. Painting the walls behind in a colour that sets off the show-stopping piece will only add to its impact, but don't be afraid to choose something unexpected - just bear in mind that a light-coloured piece of furniture will be set off by a dark background colour and vice versa. Lastly, try to ensure that the shape of your stand-out piece, is just as noticeable as the pattern - curves are ideal, because they're more inviting to the eye than straight lines.